With the junction systems you can bundle several sensor signals or distribute actuator signals. 2-way splitters are available in the designs M8 x 1, M12 x 1 and 7/8". Passive 4 / 8-way junction boxes are available in the designs M8 x 1, Ø 8 mm and M12 x 1. 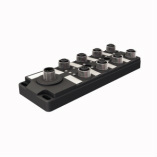 With these multiple junction systems you can transmit up to 16 I/O signals via a single multi-core cable.